Late last week Jobvite, who 3 weeks ago secured another $8.25 million in series B funding, launched their latest product Jobvite Source. A product that allows any company to source candidates through a combination of social networks without the need of their larger ATS. Jobvite Source also allows employees to refer jobs on to their contacts across tools such as Facebook, Twitter and LinkedIn. Effectively Jobvite Source is taking the social recruiting portion their ATS, Jobvite Hire, and making it available for any organisation to use, regardless of the ATS vendor. Employee Referrals – across Facebook, Twitter, LinkedIn, Email etc. 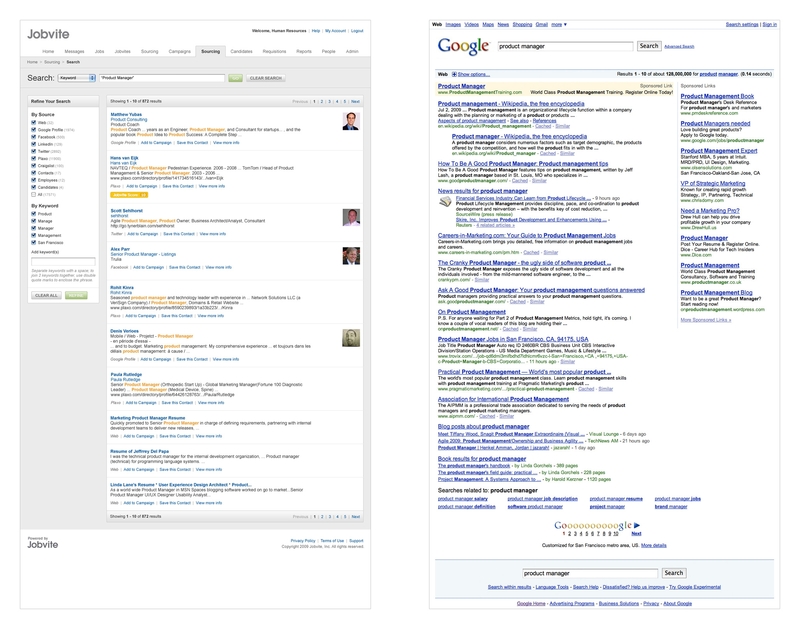 The images provided to me show a comparison searching for a “product manager” in Jobvite Source vs Google. Where as Google provides a mixture of results, Jobvite Source delivers only potential candidates. A full image was a bit large to place in the post but I uploaded it so you can view. Other features include a metrics dashboard to show recruiters the progress of their jobs across the different networks. I have requested a full demo of the product and will try and post once I have seen it. Overall an interesting move, the full press release of the launch is available on their website. With an additional $8.25 million I will expecting some big things from Jobvite in the next 12 months. While Jobvite Source offers lots of features, Australian vendor JobGenie can provide organisations very similar features for a small monthly fee. JobGenie also offers an open API so developers can build right on top of the JobGenie platform, a very unique offering. JobGenie has been a client of mine. Jobvite were very accommodating of me when I was in San Francisco in June. Posted on September 28, 2009 by Michael SpechtPosted in Recruitment, Social NetworksTagged FaceBook, JobVite, Jobvite Source, LinkedIn, social media, social networking, Social Recruiting, Twitter. This period of extreme change where extremophiles, things that survive by bring polar opposites together, will be the only organisations that survive. Organisations need to change as we are moving into the era of the free agent, “the future belongs to small organisations that build on creativeness and adaptability”. I am going to skip the first item as to me and many of you this is not new, instead let’s look at the last 4 items. Composed of scientists, engineers, architects, designers, educators, artists, musicians and entertainers whose economic function is to create new ideas, new technology, or new content. Approximately 38 million people in the US today. Kevin feels knowledge workers are old school and the world will be driven once again by the creative class. Posted on May 9, 2009 by Michael SpechtPosted in Future, RecruitmentTagged Adchemy, Entice Labs, extremophiles, JobVite, Kevin Wheeler, YuMe. There are some major changes taking place within the recruitment software market at the moment. Changes that have the ability to remove vendors such as Taleo from being “top of the pops”. What is it? Intelligent matching of jobs to social networks. Both Australian job referral vendors 2Vouch and Hoojano do this but not to the level that we are seeing from players such as JobVite and Appirio. Appirio has a US$25,000 annual fee and connects with SalesForce and Facebook. Once employees opt-in the system reviews their friends list in Facebook and match potential jobs to friends. JobVite works in a similar way but uses both Facebook and LinkedIn, then the person who had the job referred to them can also opt-in to receive future job notices from the company. ERE had a review of both Appirio and JobVite’s new features. These features validate the use of social networks for recruiting and move them from being a passive part of the process to a key component. If you are in the market for a recruitment solution the decision making process just got a little harder.